Victory! 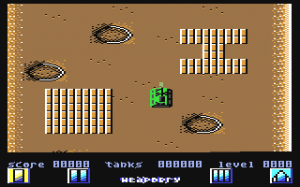 is a vertical push scroll game where you must control a tank and blast through various obstacles. It got to a fair stage of progress and was shaping up pretty well. 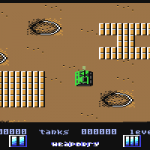 The game was started in 1986 by Ian and Michael Jones, in the hope of quickly pushing the demo around publishers to get interest. No interest was found, so the game was abandoned very early on. The remains were passed onto Ikari to release back in 1988.